The Russian vuvuzela: What noisy instrument will 2018 World Cup fans use? The spoons deployed in this Russian folk instrument are just that - real spoons, which in Ancient Rus' were part of a dining set. The 2010 World Cup is remembered for the annoying buzz of the African vuvuzelas, which drove not only the fans in the stands out of their minds but also those watching on TV. Russians are also preparing an instrument for the World Cup that they will host in 2018 - spoons. President Vladimir Putin is allotting a million rubles for their "modernization." Russia is preparing for the World Cup. With two years to go, the national instrument fans will play has already been chosen: Wooden spoons, which are a percussion instrument from Ancient Rus'. Unlike the South African vuvuzela, whose sound was similar to the din of a busy beehive, the Russian spoons have a particular appeal. In expert hands spoons can produce interesting combinations of rhythmical sounds, which in a way resemble those of Spanish castanets. But if there are many spoons and it is impossible to maintain a steady rhythm, one thing can still be said: The sound will be very, very loud. The spoons deployed in this Russian folk instrument are just that - real spoons, which in Ancient Rus' were part of a dining set. They were made of various types of wood, including linden, aspen, maple and ash. It is not known precisely when the spoons were first used as musical instruments. The first citation is from the 13th century but some historians give a date for first use in the late 18th century. The difference between them and the spoons used for eating is in their durability. To strengthen them, they are mostly made of thick and hard wood, such as maple or birch. The type of timber also determines the timbre of sound produced. One of the main requirements that a World Cup fan's national musical instrument must meet is its cultural association with the host country. Russia has a long list of national instruments, but the spoons came out top. "From the beginning we excluded wind instruments due to the large-scale criticism of the vuvuzela used in South Africa. 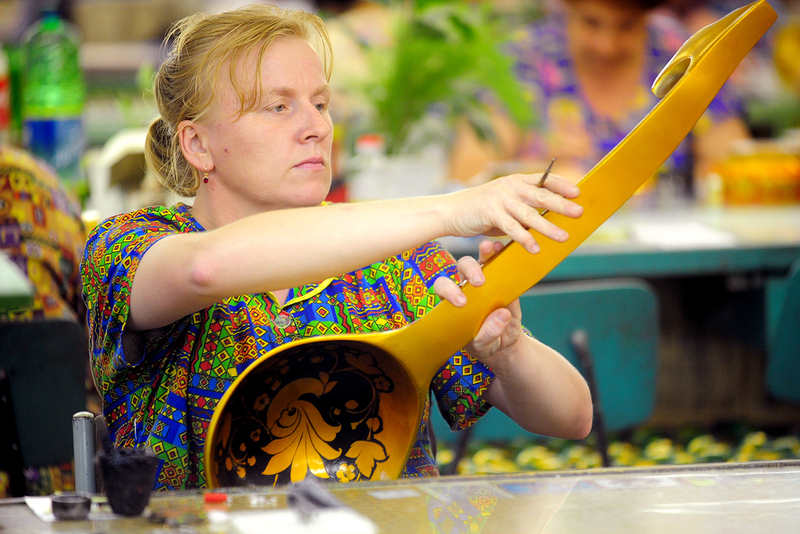 Then we excluded bulky instruments that are difficult to use, such as the balalaika, the accordion, as well as string instruments like the gusli [a type of lyre], but also the horn, the cymbals and others," Rustam Nugmanov told (in Russian) Znak.com. A musical instrument maker from Moscow's Elektrostal suburb, he came up with the idea to make the spoons a symbol of the 2018 World Cup in Russia. The idea came to him in 2010 when in Zurich Russia officially announced its intention to host the championship. But obviously he could not propose using those spoons that Russians are familiar with. The quantity of spoons that are held varies depending on the complexity of the rhythm and deftness of the spoon player. However, novices will have a hard time even with the basic number (two pieces) since the spoons must skillfully be placed between the fingers. Even Russians do not do a good job in the beginning. Especially since very few people play spoons - today the instrument can only be found in souvenir stands and is bought mostly by tourists who are unlikely to understand all its possibilities. Whatever the case, spoons are not the mainstream - they are used only by Russian folk ensembles. And they are not pipes, with which to create a noise you just have to blow into them. Nugmanov considered this problem. He developed a rubber fixer - a V-shaped holder, which will help circumvent long training sessions to master the instrument. Thanks to the fixer, the instrument now resembles the Latin letter V, alluding to the word Victoria, which means victory in Latin. The instrument's working title for now is "spoons of victory." Russian President Vladimir Putin has already approved the idea and Nugmanov expects to receive a presidential grant of about one million rubles ($17,000). Industrial designers and planners will be invited to work on the "spoons of victory" project. Also, "a series of scientific and sociological studies" will be conducted (apparently, to make sure no one goes crazy).